Transformer rewinding although sometimes more expensive than a new transformer, they can be the only way to repair that vintage amplifier or convert a unit from 120v A.C. to 240v A.C. when the spares are not available. The Transformer shown below is the most conventional type found. It comprises of ‘E’ and ‘I’ or ‘U and ‘T’ iron laminations which are grain orientated and are usually stacked in an interleaved way alternating the ‘E’ and the ‘I’s. The purpose of this is to reduce Eddy Current loss and the interleaving reduces the 50Hz vibration caused by the electro-magnetic field. Construction in this way ensures that the Iron Losses are low and the transformer does not make any noise in operation. The illustrated finished transformer has the secondary windings wound on top of the Primary. 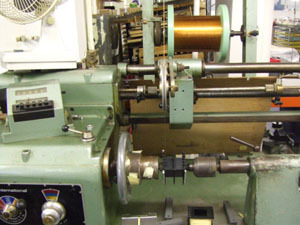 To ensure that if the insulation fails the voltage on the Primary cannot pass to the Secondary, a Copper screen is placed over the finished Primary winding and this is earthed. This Copper band also acts as an Electro-Static shield. If you look carefully at the bobbin on the winding machine, you will note there is a wall in the centre. In this construction the Primary is wound in one half and the Secondary in the other section. These types of transformers are known as Double Insulation construction. You will very often see a Copper Band around the outside of the transformer which is soldered together. 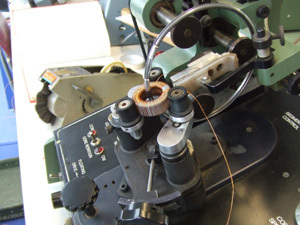 This is a method of reducing the extraneous fields that radiate from the gaps in the lamination and from the windings. Once a transformer has been manufactured it is Vacuum Impregnated to ensure that the Insulating material penetrates the windings and makes it impervious to moisture. The construction we have described is mainly for Power Transformers, however, output transformers need special attention and here windings are Bifilar Wound. This is where two wires are wound at the same time so that as near as possible they share the same flux, or they have Ultra-Linear Taps. The company famous for this was Partridge and were used in the famous Quad Hi-Fi amplifiers of the 60’s. We can now remanufacture transformers for Adam, Ampeg range of Amplifiers and Leslie Units. 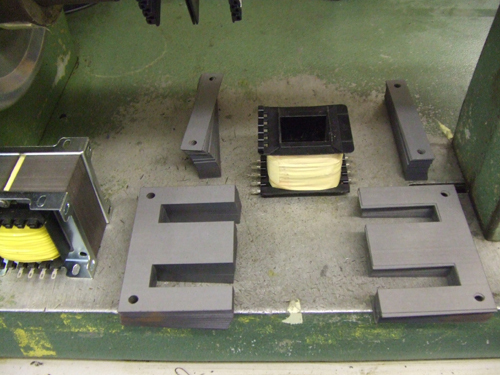 Components for a conventional ‘E’, ‘I’ transformer.